Dimensions 2.25 by 5.50 by 9 in. Amazon.com description: Product Description: When it was first erected, the House of Seven Gables typified the mechanical Colonel Pyncheon; but it developed through the years until, by Hepzibah's time, it has become humanized and almost organic. The history of the house is thus a record of continuity and change. Hawthorne's The House of the Seven Gables is a study of guilt and renewal from generation to generation. At the time of the Salem witch trials, the patriarch of the Pyncheons covets the property of a tradesman and manipulates public opinion so as to get Matthew Maule hanged for witchcraft and acquire the land. The dying man's curse on the Pyncheon family comes true generation upon generation and relationships between the families are colored forever by this "original sin." That is, until six generations later when the long-hidden truth is revealed. 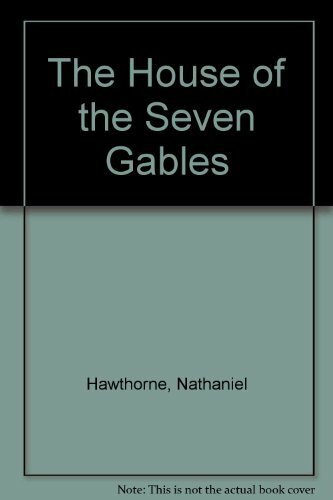 The House of the Seven Gables is Hawthorne's most humorous novel, it is also the work in which he is most serious in his devotion to the powers of beauty and imagination and his hatred of economic materialism and Philistinism.